On January 18 2007, Dr. Mark Neff of U.C. Davis called CWBC President Claudia Anderson to tell her that the previous day he had a significant breakthrough in identifying the genetic marker for chondrodystrophy. Dr. Neff told Claudia that they have narrowed the location of the mutation that causes chondrodystrophy to 30 genes in the same region on chromosome 6. While more research will need to be done to further determine the exact genes involved, Dr. Neff stated that with the information they have, they can begin to say that a specific Beagle does or does not carry the gene that causes the dwarfing condition.....". Beagles affected. with chondrodystrophy of "dwarfism" can be affected in varying degrees. Some have major defects as pictured below and others mildly affected. Many survive well in geriatric years and are beloved pets. Some have competed in obedience. Below is a techincal description of the genetic disorder. Here is a link to a story about a beagle affected with this disorder. At the bottom of the page are also additional pictures. This excerpt is from the CWBC Newsletter. To read the entire article please use this link. Use your back button to return to this page. 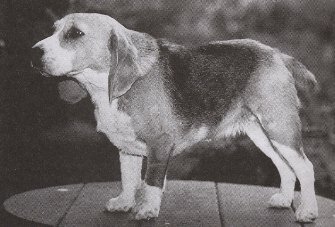 Beagle with severe chondrodystrophy.Note the shortened neck, curved back and deformed front and rear legs. Picture by Diane Quenell, published in The New Beagle. 1998 Edition (see ordering link below) Permission for posting by authors. Note the position of the front legs. Picture by Diane Quenell, published in The New Beagle. 1998 Edition. "Chondrodystrophy, also known as Chondrodysplasia and "the Funnies," is a kind of "dwarfism" caused by abnormal growth in the leg bones and vertebrae of dogs. Beagle puppies who are born with the disorder usually exhibit signs about 3 weeks of age. Usually they are significantly delayed in walking or they start walking normally, and then suffer a collapse that inhibits them from walking. The effects of the disorder range from mild to severe. In mild cases the dog may have periodic bouts of pain while growing, but these can be managed with pain medication and the dog can live a fairly normal life. In severe cases, the dog is crippled to the point that euthanasia is the most humane choice." A beagle with this genetic problem will often have crooked front legs, a short neck, a large head, a curved back and an awkward gait. for certainty that what is true of Alaskan Malamutes is true of Beagles. " 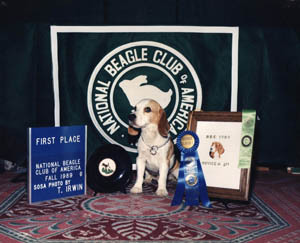 The following information is from an article printed in the Columbia-Willamette Beagle Club November 2000 Newsletter. The article was written by Dr. Mark Neff from Berkeley University. Excerpts are published here with permission from the Beagle Bugler Editor. 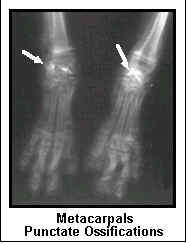 "DIAGNOSTIC: Previous research showed that affected pups exhibited radiographic punctate ossifications in the metacarpals and metatarsals. This was confirmed with radiographs of pups from our pedigree. However, this method of diagnosis was limited in that older animals (> 7 weeks) no longer exhibited these signs. With the help of several veterinarians, we found a common feature among older affected dogs a compressed seventh lumbar vertebrae (L7). 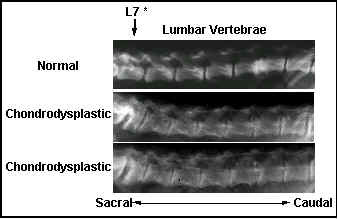 This key finding allowed for all dogs to be definitively diagnosed radiographically, either by the presence of punctate ossifications (< 7 weeks) or by a compressed L7 vertebrae (> 7 weeks) (see figures below). GENETICS:Beagle Chondrodysplasia: We assembled a large multi-generation pedigree of beagles (n = 354) that segregated rhizomelic dwarfism resembling human chondrodysplasia punctata. 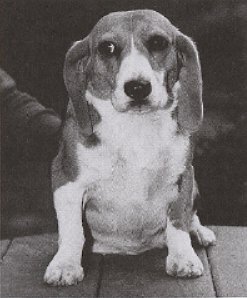 The beagle disease segregated with an apparent autosomal recessive mode of inheritance, although a significant deviation from the expected ratio existed between the sexes (9 males and 22 females).....Several disease phenotypes showed variable expressivity (e.g., dwarfism) or incomplete penetrance (e.g., closure of the frontal sinuses)." What does all that mean?? ?- Basically the mode of inheritance is "thought" to be autosomal recessive with varying degrees of expression or incomplete penetrance. This means that to have the syndrome a beagle must have inherited a recessive gene from both parents. Both parents are a carrier. Each affected beagle may exhibit a different severity of the disease with some only being mildly affected and others being severly affected-thus "varying degrees of expression or incomplete penetrance." Littermates may be carriers and this genetic time bomb may not appear again for many generations. Careful study of potential breeding partners of any litter mates should be done to identify "at risk" pedigrees. Research to identify a genetic marker was underway but in 2001 was cancelled due to lack of funding. Any beagle affected SHOULD NOT be bred. PROGNOSIS: Mildly affected beagles can live long lives and tend to be very people oriented since they usually get extra attention and handling as puppies. More severly affected beagle may have to be euthanized, especially if other genetic problems appear as well. Often seen with chondrodysplasia are bad bites, left eye cataract, short toes, early dental disease, and failure to thrive. Many do not survive until adulthood. 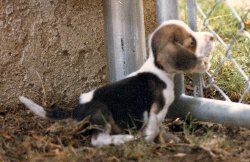 For more information about this genetic problem please read the information in "THE NEW BEAGLE".